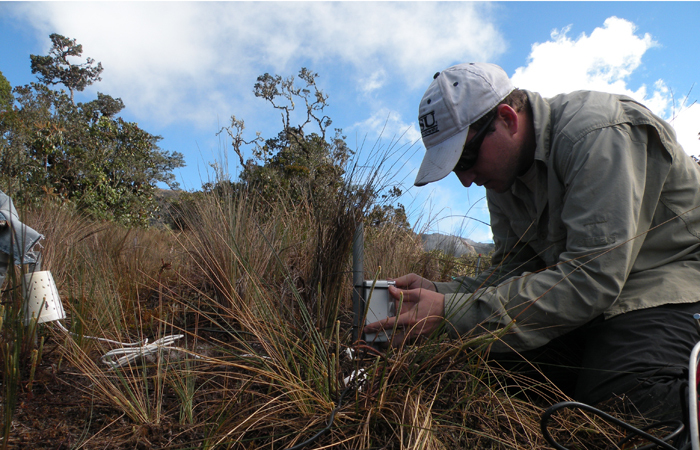 The cloud forests of the Andes Mountains are not migrating fast enough in the face of global warming, according to FIU researchers. Plant and animal species are migrating upslope throughout the tropics to mitigate the effects of increasing global temperatures. But the cloud forests, with their signature cloud and mist cover along the rainsforest canopy, are not keeping pace. Evan Rhem, a biological sciences Ph.D. student and researcher at Fairchild Tropical Botanical Gardens, has spent three years in Manú National Park (Peru) studying how the region’s tropical cloud forests will adapt to climate change. The delicate and interconnected ecosystem comprises less than 1 percent of all the world’s forests, but is among the most biologically diverse and ecologically important places on Earth. Biology researcher Evan Rehm has studied the tropical cloud forests of Manú National Park (Peru) for three years. By using homemade seed traps made of PVC piping, netting and other materials, the team of researchers examined seedling recruitment patterns, seed dispersal and microclimate at the timberline, or the edge of a habitat at which trees are capable of growing. They also looked at the puna, which is the high elevation grasslands above the forest. Their results indicated any upslope migration of the timberline into the puna will likely occur at a rate that is slower than what is required to keep pace with warming. The study, coauthored with FIU biology professor Kenneth Feeley, was published in Forest Ecology and Management.